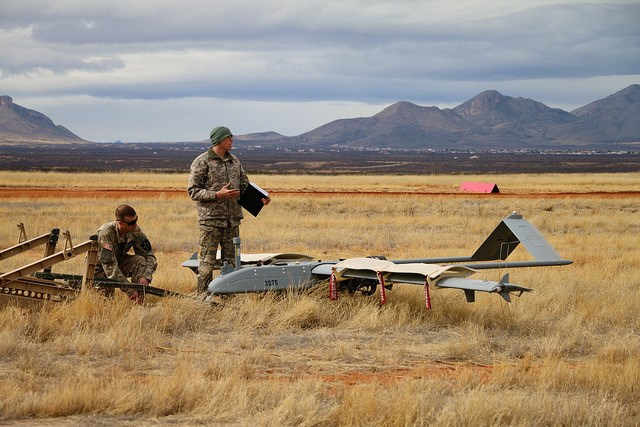 Hubbard Airfield at Fort Huachaca lost one of its drones Thursday during unit training. The 450 pound “unmanned aircraft” had a 24 foot wingspan and cost an estimated $1.5 million. The Cochise County Sheriff’s Department, Customs and Border Protection and many other officials assisted the combat team in searching for the drone, but despite all efforts they were unable to find the equipment. According to, Huachuca Public Affairs Office the drone was a Shadow RQ-7bv2, and is thought to have disintegrated on impact. The drone can fly for eight to nine hours and up to 77 miles, or 125 kilometers in the sky. 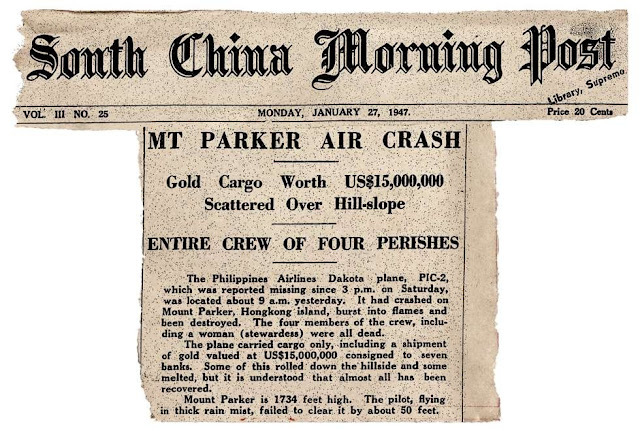 Seventy years after a Philippine Airlines plane burst into flames on impact with Mount Parker, three local history buffs have unearthed a gold coin from the crash site – and with it a forgotten mystery. The upper slopes are shrouded in dense mist and low cloud on a chilly, overcast Saturday, much as they were on that afternoon seven decades ago, as three men make the arduous trek up the steep Mount Parker Trail towards the summit, metal detectors slung over their shoulders. There was no concrete trail in 1947 and newspapers at the time reported that the police search and recovery team, dispatched from Shau Kei Wan the following morning, had to cling to shrubs and tufts of grass in order to reach the smouldering crash site, where the charred remains of the four crew members were discovered. 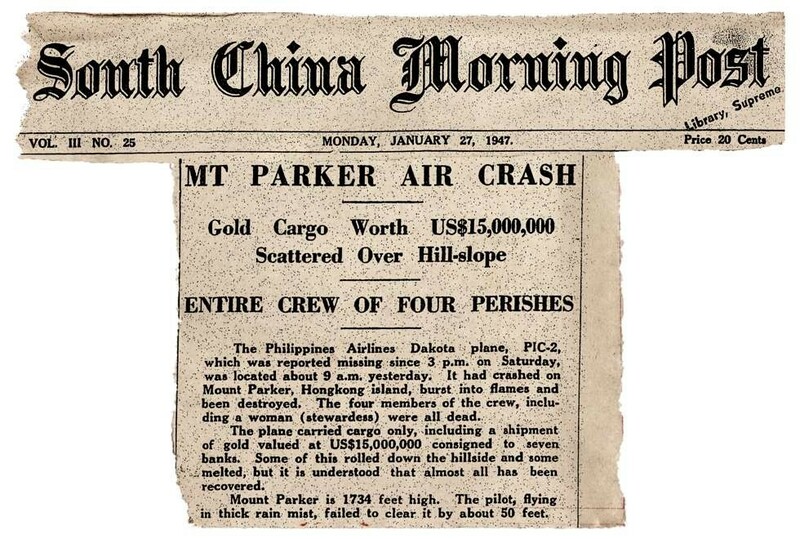 The aircraft – a Dakota bearing the registration PI-C12 – had crashed on Saturday, January 25, en route to Kai Tak airfield carrying a reported US$15 million cargo of Mexican bullion and coins, destined for seven Hong Kong banks. A significant amount of that cargo remains unaccounted for. 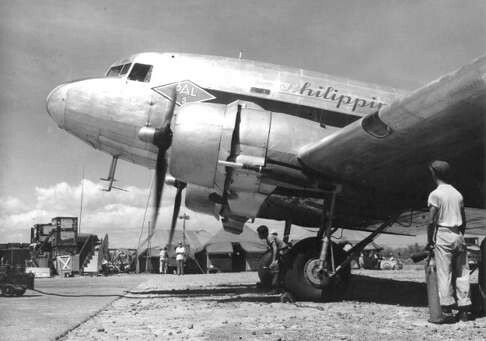 “No one else comes up here and hardly anyone else knows the story of the Philippine Airlines Dakota and the gold,” says Craig Mitchell, who confesses that if it were not for the 70th anniversary and the unexpected interest from Post Magazine, he and his two colleagues, teacher Alex Sommerville and photographer Stuart Woods, would not have made the trip. In 1947, though, the accident was headline news, provoking an official inquiry. The authorities, fearing a mini gold rush, quickly established an impenetrable police cordon while the precious cargo was recovered. The incident also generated a series of rumours, myths and conspiracy theories about the final destination of the cargo and the fate of the gold. Mitchell located the crash site by assiduously correlating the crash reports with aerial photography and press cuttings from the time and comparing them with contemporary maps. 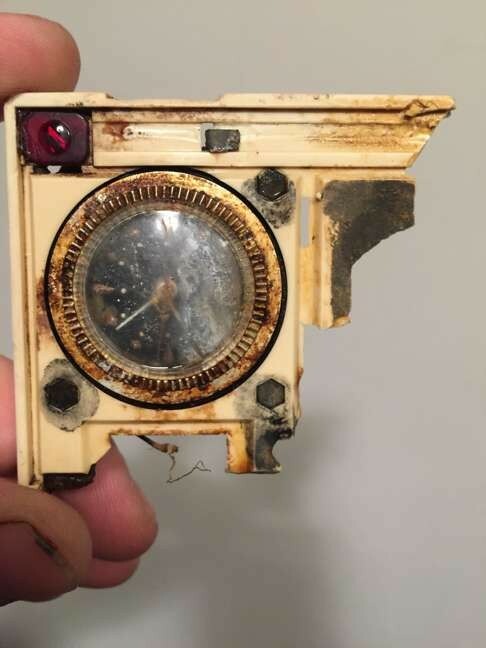 He says he has visited the site with colleagues between six and eight times, with metal detectors, but has found only small fragments of wreckage and a broken cabin clock. The dead pilot was named as Captain Theodore Weymouth, from Kansas City, in the United States, a 28-year-old ex-United States Army flier who had landed at the treacherous Kai Tak airfield several times before. He was accompanied by co-pilot Narzal Lim, radio operator Benedicto Merza and flight attendant Lourdes Chuidian. Weymouth’s wristwatch was located by police at the scene and had stopped at 3.02pm, just a few seconds after his last communication with Kai Tak. The impact explosion was so intense that gold coins had melted and become fused to the airframe while the force of the blast projected others across the slopes in a shower of Mexican gold pieces. “It is believed that some of the heavy gold bars thrown high into the air by the explosion may still lie deeply embed­ded in the soft soil of the hillside,” reported the China Mail, two days after the crash. The Douglas C-47 Dakota was an Allied military transport aircraft used extensively after the second world war by civilian airlines. “Aircraft crashes were a lot more common then – parti­cu­larly with the Dakota,” says Woods. In England, on the same day as the Mount Parker acci­dent, a Spencer Airways Dakota failed to get airborne from Croydon Airport, near London, and crashed into a parked, empty Dakota, killing 12 people. 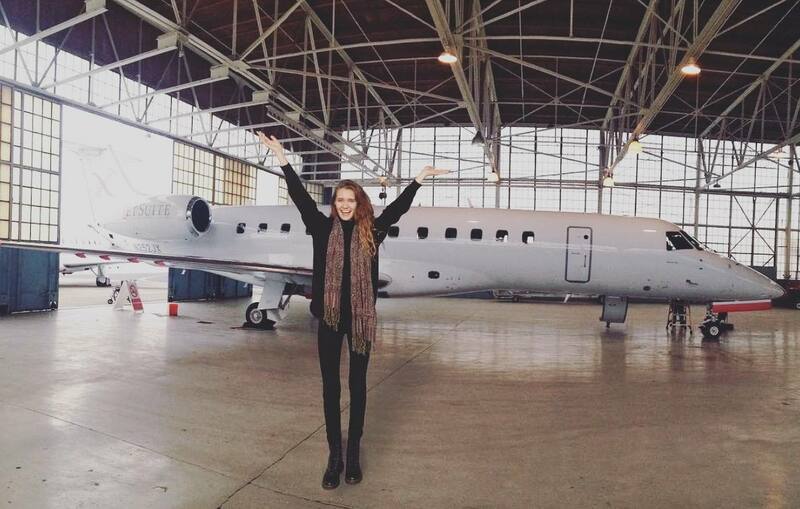 The next day, American film star Grace Moore was one of 22 killed when a Royal Dutch Airlines Dakota crashed near Copenhagen, Denmark. On February 1, 1947, 16 were killed when an Air France Dakota crashed near Lisbon, in Portugal. The Croydon accident led to questions being asked in the British parliament about its loading limits and the American authorities were forced to publicly refute British press alle­gations that these planes were “worn out US military surplus” with no place in civil aviation. 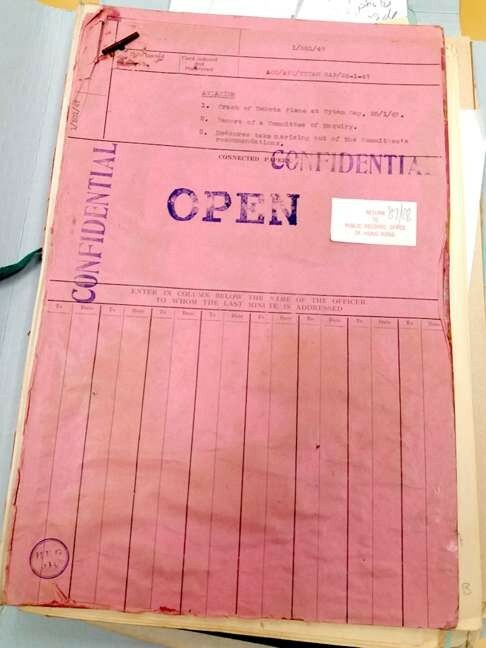 At the official inquiry into the Hong Kong crash, held on February 6 and 7, 1947, by Max Oxford, acting inspector of accidents, there was no suggestion that PI-C12, inbound from Manila, was “worn out” or overloaded (despite the 4,500 pounds of gold on board). Instead, the crash was attributed to a combination of low cloud, a failure to follow the latest “let-down” procedures for aircraft approaching Kai Tak and one critical pilot error. When flying control officer P. Stewart told the pilot to turn to port, Weymouth, who as an American would have been more used to “right” and “left”, turned the wrong way and into Mount Parker. The plane was originally reported as having plunged into the sea, in the vicinity of Junk Bay, though Mitchell suspects this was a ruse by the authorities to keep bounty hunters away from the real crash site. “The explosion must have been clearly visible to residents around Chai Wan even in bad weather,” he says. A short distance from the 532-metre summit, Mitchell checks his position and leads the small group off the trail and down a steep, boulder-strewn slope, slipping and stumbling through thick vegetation. By some granite boulders, he points through the eerie gloom to the spot where the four crew members lost their lives, but there is no obvious indi­cation a crash happened here. Metal detectors whir and buzz as the three men sweep the slopes. The damp conditions are far from ideal because they reduce the effectiveness of the detectors, explains Woods. The cloud clings to the trees and bamboo and cold, condensed water drips from above but a police photograph taken at the site in 1947 shows that then there was just low scrub here. Once they had arrived, the police team were quickly reinforced by labourers, who formed a line down the slippery slope to waiting trucks, each man carrying a heavy gold bar over their shoulder. The security and salvage operation was supervised by assistant superintendent E.C. Luscombe, who brandished a loaded revolver, just in case anyone should make a run for it with the newfound treasure. “Frisked by police officers, several coolies were found to have hidden 50-peso pieces in their waistbands or rolled-up trouser legs,” reported the China Mail, but it was not just the local labour force who succumbed to the allure of Mexican gold. Despite the discovery of at least one light-fingered European policeman (hushed up at the time), it was rumoured for years afterwards that several officers retired in lavish style on what had been retrieved from PI-C12. “There is some suspicion that certain members of the Shaukiwan police station have appropriated and disposed of at least one of the gold bars. One Chinese constable failed to report for duty on 5 February and is now missing,” states one report in the then-confidential police file on the crash. There is a handwritten comment made underneath that report which reads, “There wd (sic) be some grounds for saying that if only one gold bar is missing, the entire police force deserves congratulations.” The scribbled note is initialled “M”, which could be that of Sir Mark Young, then governor of Hong Kong. “The way things were back then, I would not be surprised if any and all of the ‘disciplined’ services who attended the crash did not help themselves,” says a retired Hong Kong police officer with an interest in the history of the force. A police report dated January 30, 1947, states that the Right Reverend Bishop N.V. Halward had been asked to enlist 20 boy scouts, to carry out a search of the hillside. That search turned up two gold bars and 90 pounds of gold coins. “I now hold [bank] receipts ... for a total weight of 3,573 lbs of gold recovered plus 50 gold coins and two half coins. As stated in my previous report the total gross weight of the gold consignment was 4,491 lbs,” a senior superintendent of police surnamed Major states in the report. The admission that 918 pounds (or more than 20 per cent of the total cargo) was unaccounted for is largely ignored. Later in 1947, the price of gold reached about US$50 per ounce, so that missing metal represented treasure worth US$734,400 (about US$9 million today). That would also value the total cargo at nearer US$5 million, not the US$15 million which was commonly reported at the time. A report in the South China Morning Post on February 1 appears to contradict Major’s account. It states that only four of the gold bars remained missing and that 24,252 of the 29,942 coins that comprised the rest of the cargo had been found. That would still imply, though, that 5,690 coins (with a current value of more than US$6.8 million) were either buried in the peaty soil of the mountain or were stolen – and perhaps used later to subsidise a number of cushy retirements. Luscombe, for one, did not retire on the proceeds of the gold. He was shot dead by bandits near Tsuen Wan on September 1, 1950 and we will never know whether he had been tempted to pick up a coin or two. 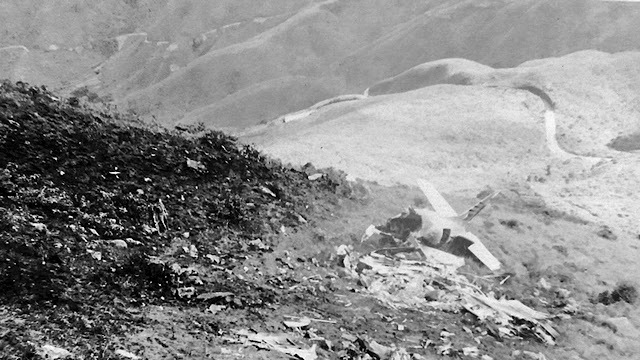 “I saw the scattered remains of the burned-out aircraft […] the ground all round was strewn with debris and glittering objects,” reported Clive Halls, of the Far East Flying Training School, who flew over the summit of Mount Parker at 11am on January 26, 1947. On the 70th anniversary, however, there is no glitter to be seen. Frontier Airlines announced 10 nonstop routes this week as part of an effort to connect the dots between cities already on its route map. The routes were spread across a number of cities, though several received multiple new routes. Cleveland landed the most from Tuesday's announcement, with Frontier revealing four non-stop routes for the Ohio city. Other airports receiving multiple new routes were Cincinnati (3), San Diego (3), Austin (2) and Minneapolis/St. Paul (2). Six airports each received one route in the announcement; they were Charlotte, Chicago O’Hare, Houston Bush Intercontinental, New York LaGuardia, San Antonio and Washington Dulles. 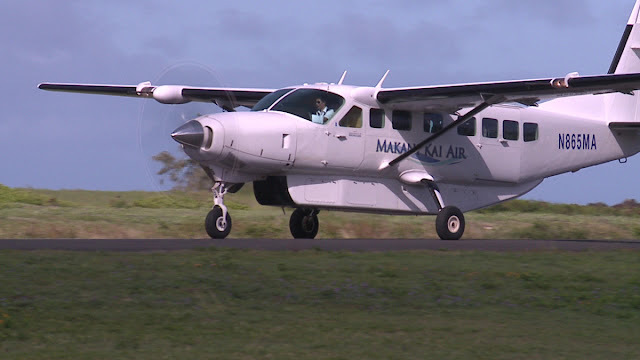 A Makani Kai Air Cessna Caravan had a close call with a Hawaiian Airlines Boeing 717 while both were taking off from Kahului Airport (PHOG) on Wednesday morning, with the owner of Makani Kai disputing initial aviation authority claims that his pilot took off without clearance. Richard Schuman, Makani Kai owner, said Thursday afternoon that he was taking a wait-and-see stance on the cause of the incident while awaiting the results of the Federal Aviation Administration investigation. Ian Gregor, public affairs manager for the Federal Aviation Administration Pacific Division, said Wednesday that a Cessna Caravan took off “without clearance” from the shorter Runway 5 at Kahului Airport as a Hawaiian Airlines Boeing 717 was taking off from the main Runway 2. The runways intersect at their northeast ends. A passenger aboard the Hawaiian flight, which was headed for Honolulu, said that both planes were in the air and estimated the distance between the planes to be about 100 yards as the pilots turned their aircraft in opposite directions. No one was injured in either plane, and there was no damage, officials with both airlines said. Gregor said that the Federal Aviation Administration is investigating the incident. Schuman did not have the passenger count at hand but said that the flight was heading for Molokai. The Cessna Grand Caravan can carry nine passengers. He said that local Federal Aviation Administration officials have told him that the cause of the incident is inconclusive and that an investigation is ongoing. Two planes were taking off at the same time, and one had permission and the other did not, Schuman said. There might have been confusion over who had clearance, he said. “Pilots don’t just sit there and say ‘green light, we are going to take off,'” Schuman said. “They only take off when they are told,” adding that pilots confirm the clearance with air traffic controllers before taking off. The investigation, which includes reviewing tower and cockpit recorder tapes from the Hawaiian jet (the Makani Kai plane did not have a cockpit recorder) and other information, needs to run its course, Schuman said. Claims about who is at fault at this point are speculation, he said. “We want to tell the truth,” Schuman said. “If Makani Kai’s at fault, the Federal Aviation Administration is going to say it, and I am going to support it. A Hawaiian Airlines spokeswoman referred questions regarding the incident to the Federal Aviation Administration. The pilot of a Cessna Caravan who took off without clearance at the same time that a Hawaiian Airlines jet was taking off thought he got the okay. 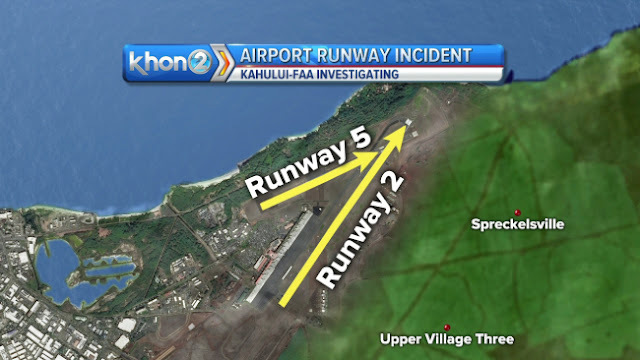 The Federal Aviation Administration told us about an incident that occurred Wednesday, when a Makani Kai Air pilot took off from Runway 5 at Kahului Airport while the Hawaiian Airlines plane was taking off from Runway 2. The runways eventually intersect, so this wasn’t supposed to happen. The FAA told us it was investigating, but we needed to find out more. We spoke with Makani Kai Air owner Richard Schuman, who said it all started with the pilot thinking he heard the tower call his flight number, which ended with the same number as the Hawaiian Airlines flight. “All commercial pilots would not just take off on their own,” he said. “Someone had to tell them, or they must have understood from someone that they were cleared to taxi, or they were cleared to take off,” Schuman said. We listened to a recording of the radio transmissions between the pilots and air traffic controller. 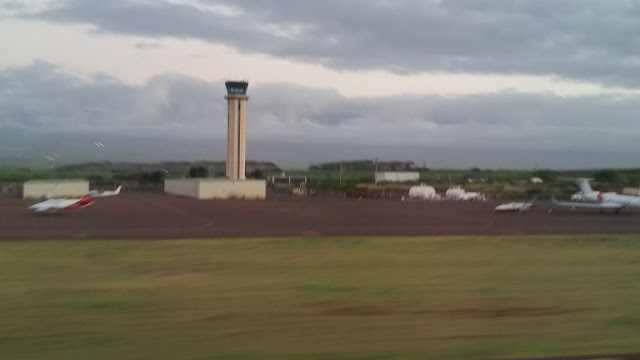 The control tower tells Hawaiian Air Flight 155 that it’s cleared for takeoff. The Hawaiian Air pilot confirms that it’s taking off at Runway 2. The tower then tells Flight 825, the Makani Kai flight, to turn left because it’s not cleared for takeoff. The Makani Kai pilot confirms to turn left to move away from the Hawaiian Air plane. The tower then tells Hawaiian Air to use caution, “caravan,” referring to Makani Kai, departing to make a left turn. Technically the FAA calls it a loss of separation, and is investigating the incident. When we listened to the radio transmissions with Schuman, he explained to us what he told FAA investigators Friday. When the tower gave clearance for Hawaiian Air Flight 155, the pilot for Makani Kai, referred to as Kaleo 825, only heard the last part “5” and thought it was for him. “When he heard ‘5, you’re cleared to take off,’ and he reads back, ‘Kaleo 825, cleared to take off’ and because tower doesn’t normally respond to that, that’s why he made the turn and he went,” Schuman said. The control tower would have corrected Makani Kai when he radioed back, but Schuman tells us his pilot and the Hawaiian Air pilot radioed in at the same exact time to confirm that they were clear for takeoff. “Both the Hawaiian and the Makani Kai pilot transmitted at exactly the same time, and the tower picked up the Hawaiian call and missed the Makani Kai call,” he explained. The owner of Makani Kai Air says it was an honest mistake, and he’s already taking steps to make sure that a similar incident does not happen again. He says his pilots will now reconfirm with the tower that they are actually cleared for takeoff by asking for a response instead of assuming that a non-response gives them the clearance. We’ve also learned that this type of incident is not likely to happen at most major airports, like Honolulu, because they have radar systems monitoring everything that’s moving on the ground. “They have someone watching what’s rolling, so if something similar was to happen, a controller would see two aircraft moving on the runway at the same time and would make an immediate call right there,” Schuman said. The Federal Aviation Administration is investigating an incident at the Kahului airport on Maui in which a Hawaiian Airlines plane and a Makani Kai single-engine Cessna aircraft nearly crossed paths while taking off. In an email sent to Hawaii News Now on Thursday, a Federal Aviation Administration spokesperson said the Makani Kai Cessna took off without clearance on a runway that intersects at one end with another runway being used to facilitate a Hawaiian Airlines jet. Makani Kai officials say there were two pilots on board the aircraft and both of them believed they had clearance to take off. Hawaiian Air passenger Mike Moyers, who is a former commercial airlines pilot, saw the Cessna outside the window heading towards them and knew something was wrong. "Just as I saw it, coming right at us from the left side of the airplane, the pilot made a hard right turn to keep from running into it. It was less than 100 yards away, maybe 25-50 yards," said Moyers. With the planes taking off at the same time, the agency says, the pilot of Hawaiian's Boeing 717 had to turn away from the smaller plane. "A controller in the Maui tower spotted the conflict and instructed the Cessna pilot to turn left to avoid the Hawaiian Airlines jet," said the statement. "The controller then alerted the Hawaiian Airlines pilot about the Cessna, and saw that the jet was already turning to the right, away from the smaller plane." The Federal Aviation Administration says it is still investigating the incident. A Hawaiian Airlines jet had to maneuver to avoid a potential collision with a Cessna aircraft that took off from the Kahului Airport without clearance on Wednesday morning, federal officials tell Maui Now. A Federal Aviation Administration spokesman said the Cessna Caravan took off without clearance from Runway 5 as a Hawaiian Airlines Boeing 717 was taking off from Runway 2. The runways intersect each other at their Northeastern ends. Ian Gregor, public affairs manager with the FAA Pacific Division said a controller in the Maui tower spotted the conflict and instructed the Cessna pilot to turn left to avoid the Hawaiian Airlines jet. The controller then alerted the Hawaiian Airlines pilot about the Cessna, and saw that the jet was already turning to the right, away from the smaller plane. 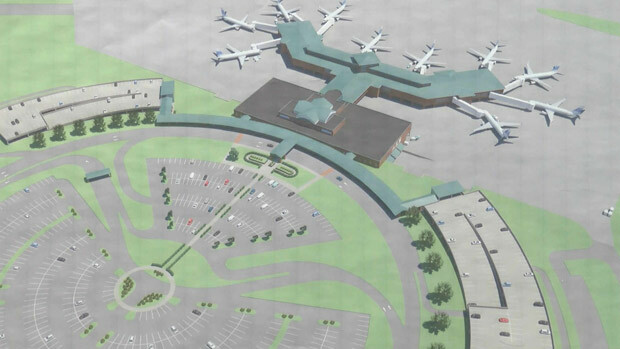 WILMINGTON, N.C. (WECT) – The Wilmington International Airport Authority met Wednesday night to discuss the details and costs associated with expansion. According to the authority, the number of incoming passengers at ILM has more than doubled in the airport’s 27-year history. They also said those large numbers are beginning to strain the existing terminal and parking structures. The Airport Authority hopes to expand the terminal by 200,000 square-feet and add two new parking garages to accommodate the increased demand. The projected cost of the entire project is $88 million, but the airport says they will only match $3 million along with $33 million in federal commitments, leaving a $52 million gap. The group unanimously voted Wednesday night to bring in a consultant that will help determine how to fill that gap. Airport Authority Chairmen Thomas Wolfe said the consultants will help keep the burden off taxpayers. Wolfe added the group will not only help fill the gap, but will aid in creating a timeline for the expansion. The authority has narrowed down their search for a consultant group and will now begin the negotiation process with those groups. Other issues on the agenda included renewing a parking contracts and reviewing the December budget. On February 1, 2017, about 1410 Pacific standard time, a Beech 95-B55 airplane, N321BJ, experienced a landing gear failure shortly after takeoff from the Cameron Airpark (O61), Cameron Park, California. The pilot (sole occupant) was not injured and the airplane sustained substantial damage to the fuselage structure. 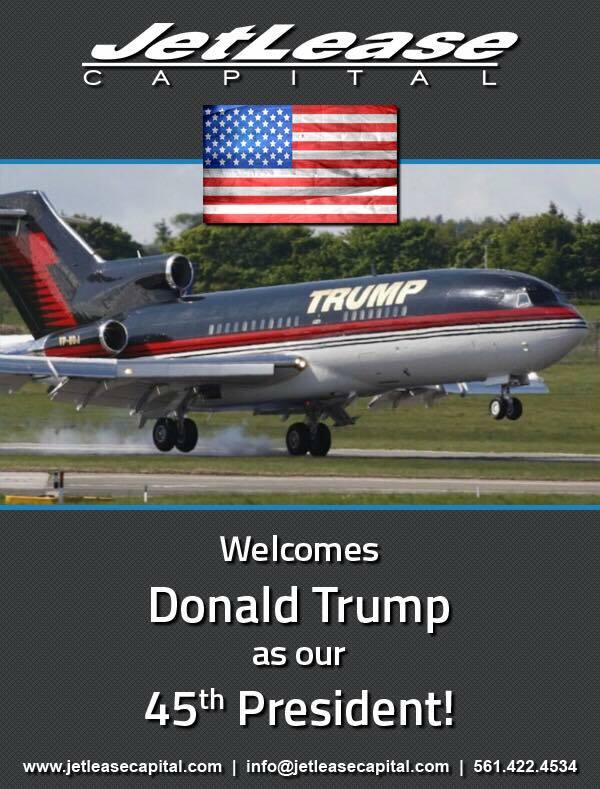 The airplane was registered to, and operated by, the pilot as a 14 Code of Federal Regulations Part 91 personal flight. Visual meteorological conditions prevailed and no flight plan was filed for the local flight that departed at about 1300. The pilot reported that when he raised the landing gear shortly after takeoff, he heard a loud crunch when the gear entered the gear wells. The pilot climbed the airplane to about 3,000 feet and observed that the landing gear circuit breaker was popped and the alternator was off. The pilot attempted to extend the landing gear normally several times, however, the circuit breaker popped each time and the gear remained retracted. The pilot also attempted to use the emergency gear extension, however, to no avail. The airplane was landed with the landing gear retracted. The flight instructor on the controls of the high skid-equipped-landing-gear helicopter reported that he was the pilot-in-command (PIC). The PIC reported that he and another flight instructor were performing simulated emergency procedures during the flight. He reported that he attempted to demonstrate a simulated fixed-pitch (right stuck antitorque pedal) emergency procedure. He reported that, during the maneuver, the nose of the helicopter was about 40° nose right of centerline. He reduced the throttle, and the nose corrected to about 20° nose right of centerline. The helicopter touched down on taxiway delta with minimal forward airspeed, and it then bounced about 5 ft above the ground and yawed right about 1 3/4 turns. The helicopter touched down a second time about 65 ft south of the taxiway centerline and rolled onto its left side. The helicopter sustained substantial damage to the firewall, main rotor drive system, and tail rotor drive system. A METAR at the time of the accident reported that the wind was from 110° at 08 kts. The flight instructor seated in the right seat reported that the wind at the time of the accident was from 090° at 08 kts. When the PIC was asked by the National Transportation Safety Board investigator-in-charge if he placed the collective in the full-down position after touchdown or if he increased the collective after the initial touchdown, he responded that he could not remember. When asked if he applied full left pedal to combat the right yaw, he said that he did not because the event happened quickly. According to the Federal Aviation Administration Helicopter Flying Handbook (FAA-8083-21A), the Helicopter Instructor’s Flying Handbook (FAA-8083-4), and Advisory Circular (AC) 90-95 “Unanticipated Rapid Right Yaw in Helicopters,” the loss of tail rotor effectiveness is a critical, low-speed aerodynamic flight characteristic that can result in an uncommanded rapid yaw rate that does not subside of its own accord and, if not corrected, can result in the loss of aircraft control. AC 90-95, Section 7.d.3. (page 7), defines flight characteristics and wind azimuths and states that the tail rotor vortex ring state occurs when the wind is from 210° to 330°. Winds within this region will result in the development of the vortex ring state of the tail rotor. The pilot-in-command’s delayed remedial action to arrest the right yaw after the bounced landing while operating in a flight regime conducive to the loss of tail rotor effectiveness, which resulted in a roll-over. The flight instructor on the controls of the high skid-equipped landing gear helicopter reported that he was the pilot in command (PIC). The PIC reported that he and another flight instructor were performing simulated emergency procedures during the flight. He reported that he attempted to demonstrate a simulated fixed pitch (right stuck anti-torque pedal) emergency procedure. He reported that during the maneuver the nose of the helicopter was about 40° nose right of centerline. He reduced the throttle and the nose corrected to about 20° nose right of centerline. The helicopter touched down on taxiway delta with minimal forward airspeed, and the aircraft bounced about 5 ft above the ground and yawed right about 1 ¾ turns. The helicopter touched down a second time about 65 ft south of the taxiway centerline and rolled onto its left side. The helicopter sustained substantial damage to the firewall, main rotor drive system and tail rotor drive system. The Meteorological Aerodrome Report for the airport which the accident occurred and at the time the accident occurred, identified that the wind was out of the 110° at 08 kts. The flight instructor seated in the right seat, reported that the wind at the time of the accident was out of 090° at 08 kts. When the PIC was asked by the NTSB investigator-in-charge (IIC); was the collective placed in the full down position after touchdown, he could not remember. When asked if he increased the collective after the initial helicopter touchdown; he could not remember. When asked if he applied full left pedal to combat the right yaw, he said that he did not because the event happened quickly. Loss of Tail Rotor Effectiveness (LTE) is a critical; low-speed aerodynamic flight characteristic which can result in an uncommanded rapid yaw rate which does not subside of its own accord and, if not corrected, can result in the loss of aircraft control. AC 90-95 Section 7. d. 3. (page 7) defines Flight Characteristics and wind azimuths: Tail rotor vortex ring state occurs when the wind is out of (210° to 330°). 1. Winds within this region will result in the development of the vortex ring state of the tail rotor. Crews are investigating a helicopter crash at the Carson Airport Wednesday night. The Carson City Fire Department says that a pilot and a passenger were practicing touch downs when the aircraft tipped over. Emergency crews were called to the scene just before 5:00 p.m. The Federal Aviation Administration and the National Transportation Safety Board will begin their investigation of the crash Thursday morning. The Carson Airport was closed for a few hours while authorities investigated the crash. On February 1, 2017, about 1536 mountain standard time, an experimental amateur-built Cozy Mark IV airplane, N294MV, was substantially damaged during a forced landing near Anthony, New Mexico. The airline transport pilot and private pilot were not injured. The airplane was registered to and operated by a private individual under the provisions of 14 Code of Federal Regulations Part 91 as a personal flight. Day visual meteorological conditions prevailed for the local flight, which had recently departed from Cielo Dorado Estates Airport (NM05), Santa Teresa, New Mexico. The two pilots had been flying about 90 minutes, during which they accomplished several approaches in the local area. While executing a go-around from NM05, the private pilot applied full power and began a climb. About 400 ft above ground level, the pilots noticed a total and abrupt loss of engine power. Based on their perception that the power loss was due to a fuel issue, the pilots turned the fuel boost pump on and adjusted the mixture control, with no effect. The airline transport pilot accomplished a forced landing into a field, during which the right wing and fuselage were damaged. The accident occurred on the second flight of the amateur-built airplane, which was equipped with a Lycoming IO-360-C1C fuel injected engine. Examination at the accident site by a Federal Aviation Administration (FAA) inspector revealed adequate fuel was present in both the left and right fuel tanks, with the fuel selector in the right tank position. At the recovery location, a mechanic's examination revealed that all fuel lines and the fuel filter were intact and unobstructed. A small amount of sanding dust was observed in the fuel filter. The fuel boost pump was tested and determined to be operational. The fuel flow divider was removed and disassembled, which revealed a small amount of sanding dust. A flow check was conducted on the fuel nozzles, with no blockages or anomalies. During rotation of the propeller, the engine displayed normal continuity and magneto operation. No engine or fuel system anomalies were discovered that would have resulted in a loss of engine power. On February 1, 2017, about 1536 mountain standard time, an amateur-built Cozy Mark IV airplane, N294MV, was substantially damaged during a forced landing near Anthony, New Mexico. The pilot and flight instructor were not injured. The airplane was registered to and operated by a private individual under the provisions of 14 Code of Federal Regulations Part 91 as an instructional flight. Day visual meteorological conditions prevailed for the flight, which had recently departed from Cielo Dorado Estates Airport (NM05), Santa Teresa, New Mexico. The pilot and flight instructor had accomplished several approaches in the local area. During a go-around from NM05, the pilot applied full power and began a climb. About 400 ft above ground level, a total loss of engine power occurred. The flight instructor assumed control of the airplane and accomplished a forced landing into a field, during which the right wing and fuselage were damaged. As part of the Directorate General of Civil Aviation safety regulations, all pilots and cabin crew must undergo breath analyzer test before and after flights. New Delhi: A woman pilot and another crewmember of state-owned Air India were grounded for three months after they failed a pre-flight alcohol test. The crew members, who have been taken off from flying for failing to clear the pre-flight medical test were to operate Air India's Rajkot flight from New Delhi on January 25, sources said. As part of the DGCA safety regulations, all pilots and cabin crew must undergo breath analyser test before and after flights. Incidentally, airline's head of operations, himself a senior executive pilot, is under probe by a committee for allegedly skipping the mandatory test close to a month. "The woman pilot and cabin crew along with other operating crew were rostered for Air India flight AI-9631 on January 25 for Rajkot from New Delhi. After they reported for duty, as per norms, they were told to undertake breath analyser test. However, the findings were positive," a source said. The matter was reported to the DGCA and the two crew members were taken off for flying for three months, the source said. Air India spokesperson was not available for comments. Aircraft rules prohibit crew members from taking any alcoholic drink 12 hours prior to the commencement of a flight, and it is mandatory for the employee to undergo an alcohol test both before and after operating a flight. Any crew member who tests positive in the pre-flight medical check or refuses to take a breath-analyzer test is required to be taken off flying duty for at least four weeks and the airline is required to initiate disciplinary proceedings. Did This Woman's Cleavage Get Her Kicked Off a Spirit Airlines Flight? A woman got kicked off a Spirit Airlines flight from New Orleans to Fort Lauderdale on Sunday . . . and she says it's because she was showing too much cleavage. And she HELPFULLY provided a photo to show EXACTLY how much of her breasts were showing out of her sweater the time. February 2, 2017 -- JetSuiteX announced Wednesday it has canceled all flights from Monday, the day of its intended debut at Santa Monica Airport, through February 24. But the company said talks will continue with the City over its plan to operate there. CEO Alex Wilcox said the cancellations were meant to “avoid uncertainty and confusion” in the wake of a new agreement between the City and federal government that called into question plans by JetSuiteX to begin providing a low-cost charter service at SMO. The consent decree between the City and the Federal Aviation Administration (FAA)closes SMO by December 31 of 2028. But in the interim, the pact also clears the way for the City to shorten the airport’s only runway to 3,500 feet from the current 4,973 feet to 3,500 -- too short a distance for charter jet operations ("City, FAA Agree to Close Santa Monica Airport in 2028," January 28, 2017). Wilcox has said he still has hope and on Wednesday said his company reached a “Standstill Agreement” with the City that delays, but does not end, negotiations. "Given the uncertainty surrounding the status of the airport we have entered into this standstill agreement to provide time for an orderly process to negotiate with the city,” he said in a statement. “We apologize to our clients, over half of whom are Santa Monica residents, who have been adversely affected by the unprecedented recent events concerning SMO airport." Wilcox said the company will issue full refunds to all impacted customers; about 1,000 tickets had been purchased since JetSuiteX announced its new service in December. In a statement issued late Wednesday, the City confirmed a “standstill agreement” had been reached with JetSuiteX. "The City of Santa Monica is vigilant in its efforts to protect the health and safety of our neighborhoods surrounding Santa Monica Airport while it is still in operation," said Santa Monica Mayor Ted Winterer. "We recognize our agreement with the FAA to close the airport in 2028 may have immediate impacts on existing aviation tenants. It is our desire to work with JetSuiteX and all other existing aviation uses to ensure a smooth and amicable transition." But the Standstill Agreement added more fuel to SMO opponents already angered by a closure date that is so distant and related issues. "Sounds to me like more backroom deals are underway to bring JetSuiteX to SMO,” said Martin Rubin, director of Concerned Residents Against Airport Pollution (CRAAP). “JetsuiteX CEO Alex Wilcox should be apologizing to the thousands of families who are truly adversely affected and whom he could care less about." Rubin said anger over the consent decree has also intensified interest in a rally by airport opponents scheduled for Saturday at 11 a.m. in the large parking lot just north of Donald Douglas Loop North. Among the speakers will be Mayor Winterer, who voted for the decree, which was approved by a 4-3 vote. Also appearing will be U.S. Representative Ted Lieu, whose 33rd District includes Santa Monica, and Los Angeles City Councilmember Mike Bonin, whose 11th district includes parts of the City impacted by SMO operations. Opponents in the decades-long battle say the airport is too close to homes and generates too much noise and jet pollution. The aviation industry regards it as a reliever for Los Angeles International Airport. The county’s oldest airport, SMO caters primarily to leisure pilots and high-cost chartered jets. JetSuite provides flying that moves your soul through transparent pricing, efficient operations, acute attention to detail, acclaimed customer service, and industry-leading safety practices. Offering a WiFi-equipped fleet of jets across the US, JetSuite was recently ranked #1 in light jet utilization by ARGUS. Under the leadership of CEO Alex Wilcox, a JetBlue founding executive, JetSuite is IS-BAO certified and rated Platinum by ARGUS, the highest possible safety rating in the private jet industry. In April 2016, JetSuite introduced JetSuiteX to offer short haul public charter flights, sold by the seat, operating from private terminals. For information please visit www.jetsuite.com. 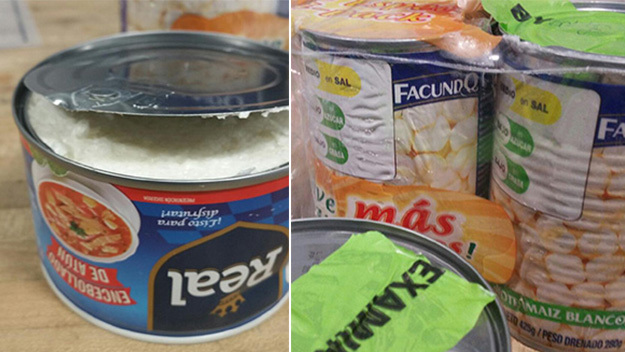 U.S. Customs and Border Protection officers seized cocaine in cans labeled tuna and corn on January 25, 2017 at Kennedy Airport. 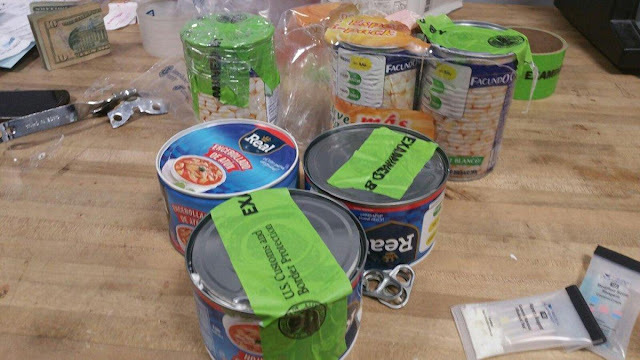 An American man is facing federal narcotics smuggling charges after authorities found thousands in cocaine stashed in cans at John F. Kennedy Airport on January 25, 2017. A technical problem has been resolved after a runway light outage at Blue Grass Airport delayed and diverted flights Wednesday night. Two flights out of Lexington were delayed, while two incoming flights were diverted, airport spokeswoman Amy Caudill said. The edge lights on the main runway were scheduled to turn on at 6 p.m. and did not, Caudill said. She said the lighting issue might have been related to ongoing construction at the airport as part of its Taxiway Safety Enhancement Program, which started in 2014. The airport announced on social media at 9:13 p.m. Wednesday that the outage was resolved and advised travelers to check their flight status Thursday morning. A smaller runway at the airport, which is only for private use, was operational during the outage.